How long have you been saying “I’m giving up smoking!” and then found yourself lighting up a cigarette again only moments later! Successful smoking cessation is challenging without proper help. But that’s where our experts come in. Our vision is to help you when giving up smoking. We know you want to stop smoking quickly. We will guide you towards lasting change, showing you how to give up smoking in just one 60 minute session. More than that, our services are backed by a lifetime guarantee, if you are not 100% successful, all future sessions are absolutely free. We have a vision to create a society free of smoking. We all know how dangerous smoking is but giving up smoking cold turkey is a huge challenge. 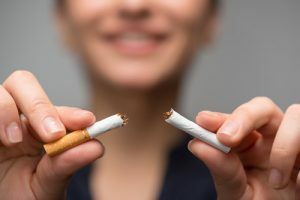 To combat the habitual nature of cigarettes, we’re here to begin your change with a personalized quit smoking timeline that takes place over four key steps. 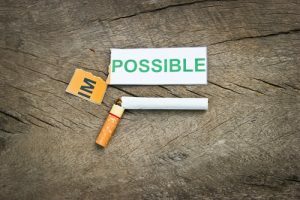 These four steps empower you, and are designed to help you easily achieve your goal of smoking cessation! As the ‘smoker’ ready for change, you bring the desire to truly quit for good and we’ll supply the therapy needed for giving up smoking for good. Our experts are so confident in our approach that we believe one session is all you need to giving up smoking. We offer a lifetime guarantee, because 95.6% of our clients are non-smokers for life after only one session. Our goal is to assist 2,500 people quit smoking every year! Would you like to become a part of this smoking cessation success story too? Would you like to wake up in the morning and not have the urge to light up a cigarette? To not have withdrawals when you haven’t had a smoke for a short while? Our Quit Smoking Experts can help you leave this lifestyle in the past. We will change you to be a healthier non-smoker, not only for others around you, but for yourself too. To learn more about our giving up smoking vision for you, or to book a quit smoking hypnotherapy session, please call us on 1300 64 53 64 or contact us today.